Winter weather is here for much of the country. 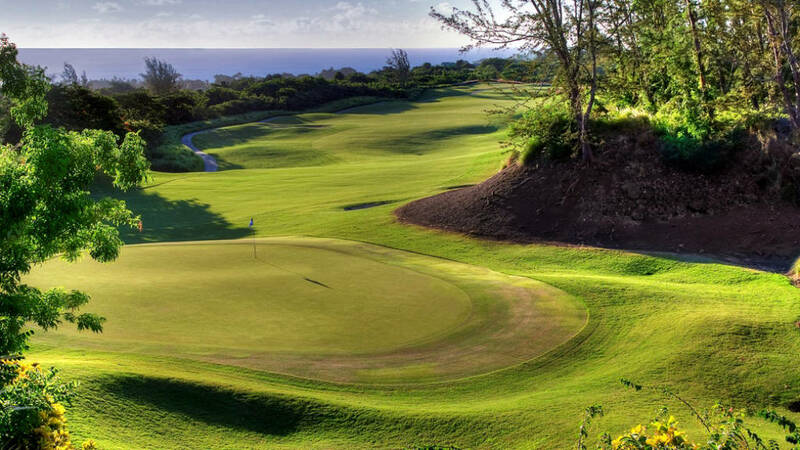 Do yourself a favor and escape way to the Caribbean for some rest and relaxation — and be sure to take your clubs. 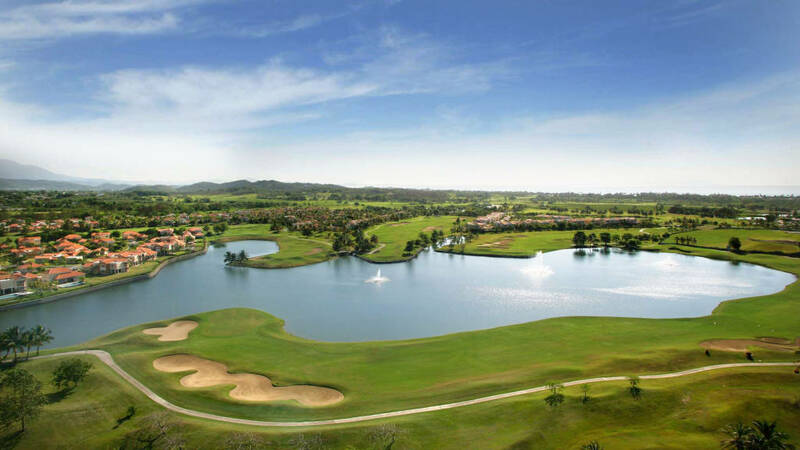 The Flamboyan Course, designed by Rees Jones and part of the Palmas Athletic Club, is named for the red or gold blooming tree found throughout Puerto Rico. The layout features wide fairways, deep bunkers and good maximum length at almost 7200 yards. Water from the Caribbean Sea, a freshwater lake and a river come into play on many holes and helps contribute to a landscape of natural wetlands. Blustery winds will alter your shots more than you wish. The course, opened in 1991, was the first layout designed by Robert Trent Jones, Jr. in the Caribbean and sits on a stretch of sandy coastline on the island’s west side. Part of the Four Season’s Resort, it offers mid-range length for a championship course (6766 yards). Holes 1 through five as well as 17 and 18 are closest to the beach and elevation changes abound. The 18th hole provides an appropriate finish. It plays toward the ocean with its green overlooking the surf of Pinney’s Beach. Designed by Greg Norman and opened in 2006, the course sits on a salt pond that was reinvigorated to enhance the island’s natural habitat setting of marshes, dunes and mangroves. Players can see the island of St. Marteen across the Atlantic Ocean starting on the first tee. Water comes into play on 13 holes and wide fairways invite aggressive play off the tees, but errant shots could find sandy waste areas and sections of exposed rock. It features good overall length, at just over 7,000 yards, but the short distance of one hole, the par-4 7th hole, carries a sense of lore. Former President Bill Clinton reportedly scored an eagle with one-putt after driving the green. 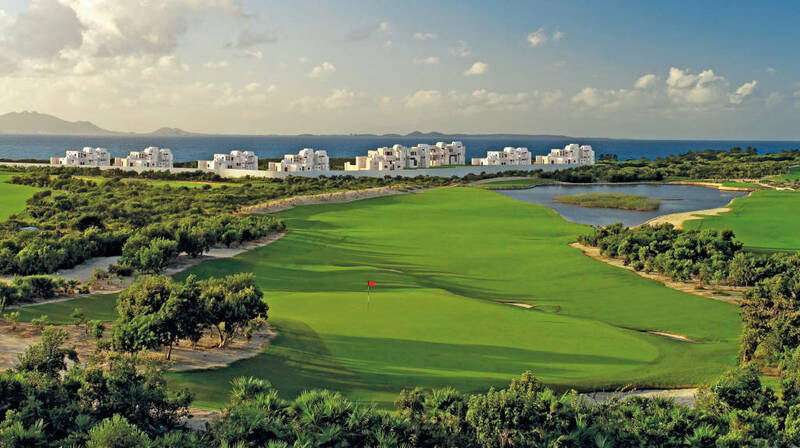 CuisinArt purchased the course, then known as Temenos, from the Cap Juluca Resort in 2011 and it remains the only golf course on the island. 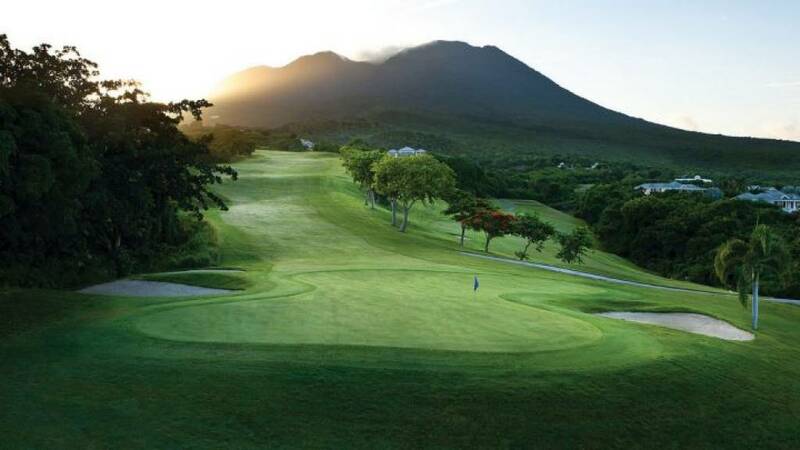 The course, located on the west coast, lays out on the island’s elevated land, offering grand views of the Caribbean waters. It’s 6870 yards long from the tips plays to a par 72. Of note is the par 4, 13th hole, only 314 yards but filled with plenty of challenges, including an out of bounds and precariously place bunkering at mid-hole. The course, designed by Robert Trent Jones, Jr., starts gently but gets progressively more difficult, most notably the finishing hole at 18, a par-4 with bunkers on the left and trees on the right providing the main challenges. 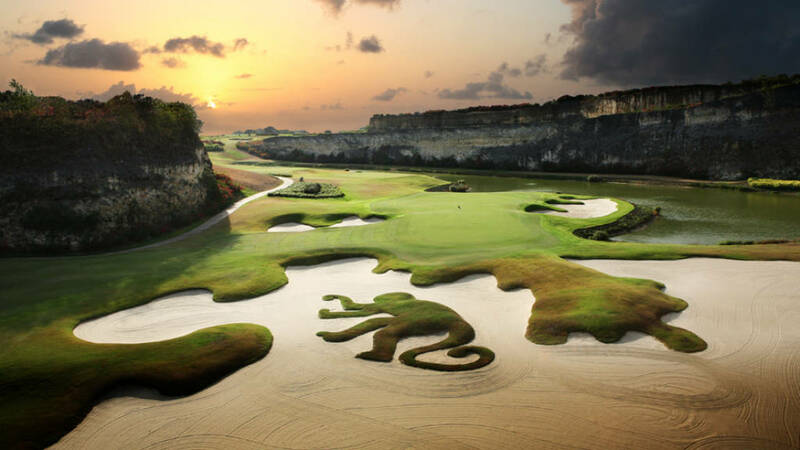 Golfers can choose from three courses at the Sandy Lane Resort on island’s west cost, but only guests of the resort can play The Green Monkey. Designer Tom Fazio built the course on an old limestone quarry. Hole 9 starts atop the rim of the quarry and typifies the course’s character. It’s the longest par 5 on the course at 635 yards and rolls gradually down into the upper tier of the quarry and through large bunkers on the right and left sides. The calming presence of the Caribbean Sea surrounds Punta Espada and large sections of white sand that serve punitive and aesthetic functions saturate its layout. Eight holes border the water but each hole offers tranquil views of the sea. 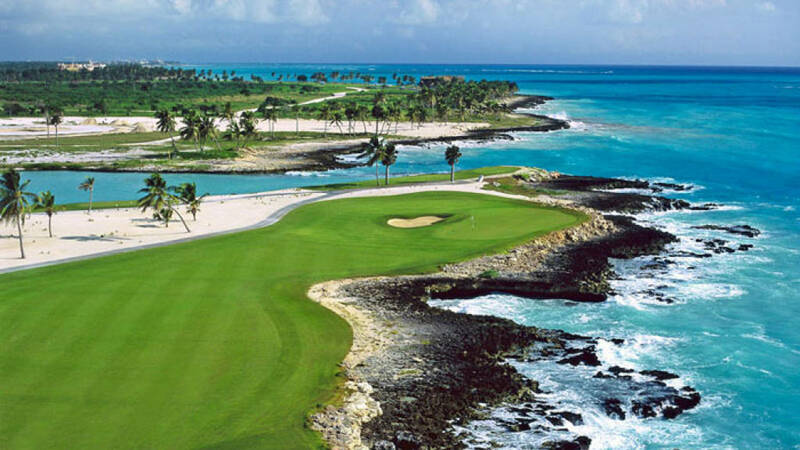 Designed by Jack Nicklaus and built in 2008, the par-72 course is part of the Cap Cana Resort and features forgiving landing areas in the fairways. But it’s long, reaching almost 7400 yards from the black tees. You’ll find plenty to bark about after you play this course. 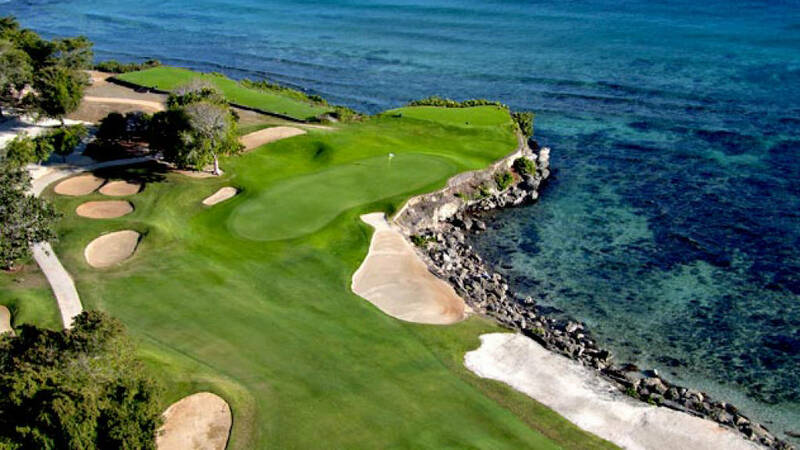 Seven holes hug the country’s southeastern coast and embrace the Caribbean Sea. Strong wind gusts can complicate matters. To buffer golf-induced stress, savor the journey through coconut and citrus trees and relish the physical beauty that surrounds you. Dominican workers used sledgehammers, pickaxes and chisels to crack the coral and help shape the dynamic features of the course. Makes a triple bogey seems insignificant. – Off Par: Is Matty On The Bad List?